And with that, we are all done for today. Thank you for joining us, and we will be back again tomorrow from 10:00 BST to see if Yorkshire can end 13 years of Championship hurt and lift the Division One crown at Trent Bridge. An enthralling final day in prospect at Lord's as Middlesex close day three on 44-1, needing another 352 runs to beat Durham in Division One, in a game crucial to both sides' survival hopes. Division Two leaders Worcestershire were hoping to seal promotion this week but, despite a sparkling maiden first-class century from Jack Shantry today, they will need a special effort with the ball to beat Surrey. The visitors, chasing a target of 217 for victory, are 30-1 at the close of day three. Former Worcestershire captain Vikram Solanki will resume on 21 not out in the morning. Still two matches ongoing - Middlesex v Durham in Division One and Worcestershire v Surrey in Division Two. "Ashwell Prince was out with seven balls left in the day for an excellent 85. Surprisingly it was Jos Buttler who came out to face the final over, but Lancashire survived and finished on 203-4, a lead of 89." Lancashire are desperate for victory to boost their Division One survival chances but the loss of Ashwell Prince in the final few minutes of the third day could prove crucial. Sussex have the advantage overnight, but all three results are still possible at Hove. Earlier, Glamorgan beat Derbyshire by 106 runs in Division Two. match report from Cardiff here. A crucial late blow for Sussex against Lancashire at Hove, as Ashar Zaidi removes Ashwell Prince for 85. Lancashire are 202-4 in their second innings with a lead of 88 runs. It has been a wonderful day for Zaidi, who struck 66 with the bat this morning to put Sussex in control in the battle at the bottom of Division One. It will be a big surprise if relegated Northants avoid an innings defeat at Edgbaston tomorrow. They trail by 151 runs at the close of day three with only five second-innings wickets remaining. BBC London 94.9's Kevin Hand: Extraordinary decision by the umpires to bring the players back out - the lights are glowing in the ground - hardly an improvement. Nine overs left. Also all over for the day at Bristol, where the Division Two match between Gloucestershire and Leicestershire is heading for a high-scoring draw. All over for the day at Trent Bridge. At the start of day three, Yorkshire needed 16 wickets to clinch the Division One title. They have taken 11 of them, with veteran left-armer Ryan Sidebottom again pivotal to their progress. I expect to be telling you at some point tomorrow that Yorkshire are county champions. Sorry, people of Yorkshire. One more night to wait. One more over for James Taylor and Gary Keedy to see out, but even if they make it through to tomorrow morning, it seems nothing will be able to stop Yorkshire becoming county champions again. They need another 180 runs to make Yorkshire bat again. Dom Gillan: Got an email from @CricketingBears about buying #Ashes2015 tickets... can we not play someone else for once? Overkill. Charlie Rhodes: Jonny Bairstow's chat through stump mic is both hilarious and relentless!!! And, as his beloved Yorkshire march towards the Championship crown, some thoughts from Geoffrey Boycott. Gary Keedy is living dangerously. Yorkshire have about a million men around the bat and Adil Rashid is getting the ball to spin and spit off a wearing Trent Bridge pitch. Somehow the veteran survives - for now. Rory Burns is Surrey's first wicket to fall as they chase 217 to beat Division Two leaders Worcestershire at New Road. Mitchell McClenaghan, who will return to New Zealand at the end of this match following the death of his father, traps the opener lbw for five. 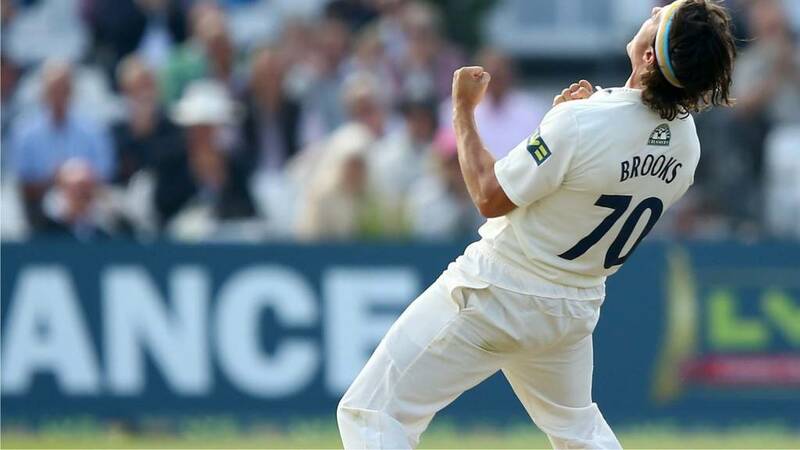 Warwickshire's pursuit of second place in Division One is gathering pace. They have reduced already-relegated Northants to 127-5 in their second innings, meaning the visitors need another 173 to make the home side bat again. Adam Rossington is out for 44, becoming Kiwi spinner Jeetan Patel's second wicket. "There's a difficult equation for Lancashire captain Glen Chapple to work out tonight. His side need to set Sussex an attainable target and allow themselves enough time to bowl the hosts out. It's not easy. "There are 10 overs left in the day with Lancashire leading by 74 with seven wickets to go. Ashwell Prince and Steven Croft have added 77 for the fourth wicket." Over to you then, Gary Keedy. The 39-year-old is sent in as a nightwatchman for the closing stages of day three. BBC Radio Leeds' Dave Fletcher: "To explode one through Riki Wessels' defence like that after bowling all day is unbelievable from Ryan Sidebottom. It completely knocked the off stump out of the ground. That's a special bit of bowling. It's kept Yorkshire's hopes of finishing this off tonight alive. It might be under the setting sun at Trent Bridge on the third day that Yorkshire seal the County Championship title." BBC Radio Newcastle's Martin Emmerson: "It has been a gloomy day here at Lord's and the umpires have taken the players off with 10 overs to go for bad light. "In the two overs bowled of the Middlesex second innings, the hosts lost their captain Chris Rogers lbw for four. "Middlesex are 6-1, chasing 396 to win tomorrow. Tim Murtagh enjoyed his day taking 10 wickets in the match for only the third time." Ryan Sidebottom comes around the wicket and sends the off stump of Riki Wessels flying about 10 yards behind the Notts batsman. Superb bowling from the veteran. Five more wickets needed. Surely too late for Yorkshire to wrap things up tonight? Chris Dent will feel he has missed out in this feast of runs at Bristol. The Gloucestershire opener, who made 24 in their first-innings total of 646 all out, has gone for two second time around. The hosts are 8-1 and lead Leicestershire by 89 runs. BBC Radio Newcastle's Martin Emmerson: Chris Rogers out LBW for 4 to @johnhastings194 He's made 14 in four innings v @DurhamCricket this season. @Middlesex_CCC 4-1. Big breakthrough for Durham at Lord's as Australia Test opener Chris Rogers is lbw to John Hastings for just four, missing a length ball on middle stump as he attempted to whip it through the covers. It's worth remembering that Rogers hit an amazing double century in that remarkable run chase against Yorkshire earlier this year. Chasing 396 to win, Middlesex are 4-1. "As Warwickshire look for the six Northants wickets they need for victory, there has been news of a new two-year contract for batsman Ian Westwood. The county have, however, refused to confirm reports that Jeetan Patel has agreed to continue as an overseas player for another season." BBC London 94.9's Kevin Hand: Middlesex chased 472 against Yorkshire earlier this season but 396 is tough and Durham will fancy the 12 overs that remain tonight in the gloom. "What an amazing innings from Jack Shantry. His maiden first-class hundred came from 86 balls and contained some extraordinary shots as he finished unbeaten on 101." James Taylor reaches a half century for Notts at Trent Bridge. He has stood firm while the hosts have been losing wickets with alarming regularity. He needs someone to stay in with him, and maybe Riki Wessels, who is currently seven not out, can be that man. Jade Dernbach wraps up the Worcestershire tail to finish with 4-72 and leaves Surrey needing 217 to win their crucial Division Two promotion battle at New Road. It could have been a much more modest target, but for the heroics of Jack Shantry, who finished 101 not out from 89 balls. "What quick work from Jonny Bairstow. Standing up to the stumps, he whipped the bails off so quickly. Bairstow couldn't believe it initially. Samit Patel lifted his back foot up and it was so close. It was a sharp ball from Steven Patterson, taken very quickly by Bairstow and Samit's boot is just hanging there. Nottinghamshire didn't need that." These wickets are like buses. You wait for one, and then they all come at once. Durham are the latest team to lose their final wicket, Peter Chase the man to fall lbw to Ollie Rayner for a duck against Middlesex at Lord's. The hosts will need to chase down 396 for if they want to gain a priceless victory in the Division One relegation battle. After Charlie Shreck's dismissal, it's only taken Gloucestershire two more balls before Jigar Naik becomes Liam Norwell's third victim of the innings and the final Leicestershire wicket to fall. Glamorgan have wrapped up a 106-run victory over Derbyshire at Cardiff in Division Two. Graham Wagg takes the final wicket, getting Mark Footitt caught by Dean Cosker for six. The visitors are all out for 154 in 52.1 overs, falling well short of their victory target of 261. A sharp piece of work from Yorkshire wicketkeeper Jonny Bairstow dismisses Samit Patel for 25. Patel leaves a delivery from Steven Patterson, and then lifts his foot from the ground, allowing Bairstow to take off the bails. The third umpire pushes the button for the red light, and Patel has to go. Worcestershire's Jack Shantry has reached 100 from 86 balls against Surrey. Not only a huge personal milestone, but he has saved the Division Two leaders from great peril to set up what could be a tricky run chase for Surrey. Given he took 6-87 in Surrey's innings, I think the man-of-the-match award may have already been sewn up. The hosts are 348-8, giving them a lead of 214. Charlie Shreck is the ninth Leicestershire wicket to fall, caught and bowled by Tom Smith for 12. The visitors are 565-9. Francis: Can Yorkshire please finish this off tonight, as I think my girlfriend will kill me if I keep checking the scores tomorrow! Rafi, Manchester: I'm still slightly tragically holding out hope than Lancashire can set Sussex 220 to win, bowl them out, and then win the next game to heroically avoid relegation. I can't believe I've succumbed to deluding myself that Lancs are anywhere near good enough to beat the drop. Northants lose Rob Keogh, edging behind for 26 and they are 91-4 in their second innings at Edgbaston, trailing Warwickshire by 209 runs. Notts duo James Taylor and Samit Patel are making serene progress and taking advantage of the attacking fields set by Yorkshire captain Joe Root as the visitors close in on the Division One title. They have already put on 47 for the fourth wicket, holding up Yorkshire's quest for glory. One more wicket needed for Glamorgan to claim a Division Two victory against Derbyshire, who are 135-9 and still 126 runs shy of their victory target. Michael Hogan has another, this time David Wainwright the man to go. Durham are eight wickets down against Middlesex at Lord's - John Hastings has gone for 28 and the visitors are 369 in front with two wickets remaining. It's a nice moment for Middlesex seamer Tim Murtagh, who has 5-76 in the second innings and 10 wickets for the fourth time in a first-class match. BBC Newcastle's Martin Emmerson: 50 partnership now from @gmuchall (67) and @johnhastings194 (28). @DurhamCricket lead by 279. 6 50+ partnerships for them in this game. The floodlights are still on but that hasn't stopped Ashwell Prince, who has made his half century from 92 balls. Lancashire are 146-3 and lead by 32. Three wickets in 18 balls for Gloucestershire. Ollie Freckingham is the latest Leicestershire batsman to fall and they are 549-8 at Bristol. After an early scare when he edged through the slips, Samit Patel is now 14 not out off seven balls. BBC Nottingham's Dave Bracegirdle: Samit Patel, after a pair at Headingley and a duck in the first innings, hits his first ball for 4. Leicestershire's Rob Taylor has just become the fourth victim of the day at Gloucestershire, as his side move to 547-6, 99 runs behind. Jack Brooks makes an immediate impact as Alex Hales's enterprising 43 ends with a superb return catch from the Yorkshire paceman. Hales lashes a straight drive back to the bowler, who pouches it smartly. Seven more wickets needed for the title. Alex Hales is approaching a half century for Notts - he has 43 off 44 balls at Trent Bridge. Yorkshire are bringing Jack Brooks back into their attack. Why does he wear a headband? This 2009 pic of the younger Brooks may offer a clue. Northants are 55-3 in their second innings and trail Warwickshire by 245 runs. James Kettleborough is the latest man to fall, caught by Rikki Clarke off the bowling of Jeetan Patel. Division Two leaders Worcestershire have recovered from a difficult position to take a lead of 145 runs over Surrey at New Road. Jack Shantry, who has posted a career-best 57 not out so far, and Joe Leach, who has just been dismissed for 50, have helped them to 279-8 - putting on 108 for the eighth wicket. Essex wrapped up a nine-wicket win over Kent at Chelmsford in double-quick time. Essex are still well in the hunt for promotion from Division Two. BBC Sport's Lizzy Ammon: Rob Keogh has some Warwickshire friends round him whilst he bats. The situation is this - win and Yorkshire are champions. A draw will also be enough if Warwickshire fail to win their game with Northants. A draw will give them 12 points and if Warwickshire win with maximum points, Yorkshire would need four points from their final game to win the title. In Division Two, the end is nigh for Derbyshire as Glamorgan are two wickets from a first Championship win since June. Wes Durston is out for 72, becoming Michael Hogan's third victim of the innings. Only Durston and Wayne Madsen have reached double figures for Derbyshire, who are 122-8 chasing 261 for victory. BBC Newcastle's Martin Emmerson: 83 balls & 9x4s for @gmuchall 50 @DurhamCricket move to 230-7 and lead @Middlesex_CCC by 331. 45th time he's made at least 50. We asked what is the best sporting celebration you have seen? Get involved by using #bbccricket on Twitter, emailing tms@bbc.co.uk or texting 81111 with your name and message. Many are saying Notts duo Alex Hales and James Taylor should be considered for England Test selection, and they could prove that here by helping their side save the game from a terrible position in the match. No alarms so far after tea, but still lots of work to do. Leicestershire's game with Gloucestershire at Bristol is petering out to a high-scoring draw. Niall O'Brien is out for 119 off 108 balls, an innings that included 13 fours and five sixes, leaving Leicestershire 529-5 and still 117 behind. If you want runs, go to Nevil Road. If you want wickets, go to Trent Bridge. Ball-by-ball radio commentary continues on all seven matches via the Live Coverage tab. Glamorgan are closing in on victory against Derbyshire at Cardiff. The visitors are 111-7 following the dismissal of Wayne White for six. Chasing 261 to win, much will depend on Wes Durston, who is 61 not out. BBC Sussex's Adrian Harms: Lancashire have moved into positive territory at Hove as they lead by two runs at the tea interval. With the wicket starting to turn, albeit slowly, this contest is far from over. Ashwell Prince is 36 not out at the break, and he may hold the key to Lancashire setting Sussex a target tomorrow. Ashar Zaidi made 66 in the Sussex innings and is now amongst the wickets, having Karl Brown caught behind by his namesake Ben for 29. With Zaidi making the ball turn, it could be an interesting final day. Thanks very much, Phil. And save me a doughnut. What happened while I was away? Well, more of the same really. Yorkshire are in command against Notts and cruising towards the Division One title. The home side begin the final session of day three on 45-2 in their second innings, trailing by 284 runs. Put simply, they need a miracle to save this match. Right, after an enthralling afternoon session, it's time for me to go and grab some custard doughnuts and hand you back to the ever-capable Phil Cartwright. BBC Sport's Lizzy Ammon and BBC Coventry & Warwickshire's Clive Eakin: Warwickshire continue their hunt for second place - which, whilst it might seem like the bridesmaid spot, is important in financial terms as the runners-up pick up £162,000 in prize money for the players and £52,000 for the county. Like Yorkshire, Warwickshire will need eight wickets in the final session to complete a three-day victory at Edgbaston and probably move into second place. James Kettleborough continues to bat well in this match - he is currently 24 not out - but Northants still need another 247 to avoid an innings defeat. It is a huge ask for a side lacking in confidence after a horrible season. So, it looks almost certain that the County Championship title will be heading to Yorkshire for the first time since 2001, with the trophy in the hands of captain Andrew Gale. Gale, banned for the final two matches of this season, told BBC Radio 5 live sports extra earlier today that if the White Rose were to win the title, he would do a "John Terry" and celebrate on the pitch. We'd like to know what the best celebration that you have seen is? Use #bbccricket to get in touch on Twitter, or email us on tms@bbc.co.uk or text 81111 with your name and message. BBC Newcastle's Martin Emmerson: "Durham captain Paul Collingwood was out for 58, one short of his first-innings score, as he got an inside edge to Steven Finn and was caught behind. The wicket marked tea at Lord's on day three, with Durham in a decent position at 218-7, a lead of 319. "Durham, who have only won once here back in 1998, had been under a lot of pressure when Collingwood and Gordon Muchall came together with the side on 139-6. "Tim Murtagh has been impressive for the hosts, taking nine wickets in the match so far." I think I may have given Paul Collingwood the kiss of death... Sorry Colly. The Durham captain has edged behind off Steven Finn for 58, as his side lead Middlesex by 319 runs with three wickets still to go. Another eventful session at Trent Bridge, with Yorkshire tightening their grip on the county title. After dismissing Notts for 203 in their first innings, their decision to enforce the follow-on has proved a good one, with Ryan Sidebottom and Jack Brooks both striking and having further chances spilled in the slip cordon. Barring an amazing rearguard action, Yorkshire will seal the win they need to clinch the Championship crown. Lancashire trailing Sussex's first-innings total by just three runs with seven wickets remaining have just suffered the loss of Karl Brown for 29 when he edged Ashar Zaidi to his namesake Ben Brown. Niall O'Brien has followed Leicestershire team-mate Ned Eckersley in reaching his century against Gloucestershire. The pair have put on 158 for the fifth wicket, which is pales in comparison to the 392 made together by Gloucestershire's Alex Gidman and Gareth Roderick. Alex Hales and James Taylor seem to have settled down Nottinghamshire's innings, and will be hoping to take their side into the tea interval without any more losses in a game which could easily run away from them. BBC Sussex's Adrian Harms at Hove: "Lancashire are making good progress in clearing their first-innings deficit of 114. Ashwell Prince is leading the way with 31 not out as Lancashire have made their way to 91-2 with 39 overs left in the day." Glamorgan have been bowling excellently against Derbyshire ever since lunch, and Jim Allenby has taken his side's fifth wicket since the break, coming in the shape of Gareth Cross for a 12-ball duck at Cardiff. The visitors will need to dig in now, with only four wickets remaining, and still requiring 176 for victory. Durham captain Paul Collingwood has taken his side into a lead of over 300 runs against Middlesex at Lord's. But the hosts chased down 472 against Yorkshire in April at the same ground and undoubtedly that will be at the back of the captain's mind as his side currently find themselves 201-6 in their second innings. BBC Newcastle's Martin Emmerson: 70 balls, 5x4s & 3x6s for @Colly622. His second 50 of the game after being dropped on 13, and sixth of the season. @DurhamCricket lead by 298. Yorkshire and England pace bowler Liam Plunkett, who is recovering from an ankle injury, says that moving to Headingley re-ignited his passion for cricket. "The last few years at Yorkshire have been amazing. I moved at the right time," he told BBC Radio 5 live sports extra during the break between innings at Trent Bridge. "My dad said to me when I first joined Yorkshire to approach it as though you've signed your first ever professional contract. It opened my eyes a little bit when I started playing for Yorkshire. I missed playing cricket at the highest level. "Coming here, I had to earn my place. I took six wickets in my first game and that was a feel good factor. It reminded me I could still do it. Once you get a bit of confidence you can excel. It's been great to be a part of this team." BBC Coventry & Warwickshire's Clive Eakin at Edgbaston: "Chris Woakes is showing the sort of qualities that have earned him his first England central contact. An impressive spell from the Birmingham End has seen the Warwickshire bowler claim the first two Northants second-innings wickets, with a fast delivery sending Kyle Coetzer's off stump cartwheeling out of the ground." BBC Radio Leicester's Richard Rae: Ice creams arrive in the Bristol comm box! @leicsccc v @Gloscricket. Leicestershire batsman Ned Eckersley might fancy one of those - he's just reached his century off 215 balls to take his side to 470-4, still 176 behind Gloucestershire's mammoth first-innings 646. Yorkshire's Adam Lyth was oh so close to adding yet another catch to his tally of 31 this season, dropping Alex Hales off Jack Brooks. Soon afterwards James Taylor edged Ryan Sidebottom on to Gary Ballance at third slip, but the England Test player is unable to hold onto it. Brooks - the leading wicket-taker in the Championship this season before this round of games - and Sidebottom really are putting the pressure on Notts. Northants could be heading for an innings defeat at Edgbaston, where Chris Woakes has taken his second wicket for Warwickshire. Kyle Coetzer saw his off-stump flying for five and the already-relegated visitors are 34-2, trailing by 266 runs. James Ashley: Loving watching @Yorkshireccc's rapid charge to the title - although there's been a few poor LBW decisions from the umpires. Matt Farr: A Root must have excellent Ballance to avoid Leaning. Ferg: I'm trying to work out why Adil Rashid hasn't been given a chance with England as a batter/spinner. Had a great season. Derbyshire are making hard work of chasing 261 for victory against Glamorgan at Cardiff, Alex Hughes's duck leaving the visitors 68-5. Damo, Leeds: Stop taking wickets Yorkshire - tomorrow is my day off! Notts are in real danger of turning this into a procession now as Michael Lumb plays a loose shot off the bowling of Jack Brooks straight into the hands of Gary Ballance at third slip for just nine. Eight wickets now remain for Notts, and they still need 320 runs to avoid an innings defeat against the team that were considered to be their closest rivals before this match. A breathless start to Notts' second innings at Trent Bridge, with Ryan Sidebottom taking a wicket with the very first ball. Elsewhere, Derbyshire have lost Wayne Madsen for 26 and are 64-4 in their second innings against Glamorgan, while Warwickshire's Chris Woakes has struck to remove Northants opener Stephen Peters. At New Road, Surrey are tightening their grip on their Division Two match with Worcestershire. The hosts are 171-7 in their second innings after the loss of Ben Cox, giving them a slender lead of 37. Well the decision to enforce the follow-on has paid dividends instantly, with the evergreen Ryan Sidebottom trapping Steven Mullaney leg before wicket with the first ball of the innings. However, there is more controversy, as the ball may have pitched outside leg stump. Nevertheless, Yorkshire have nine wickets left to get before they are crowned county champions. Yorkshire captain Joe Root has placed his trust in his bowlers' fitness and put Notts back in to bat, still 329 in arrears. Will that prove to be the right decision? Let us know what you think. At the bottom of Division One, Lancashire are now 56-2 in their second innings and trail Sussex by 58 runs. Australia international Usman Khawaja is out for 20, caught by Michael Yardy off the bowling of Steve Magoffin. There it is! The "headband warrior" Jack Brooks strikes and finally gets Harry Gurney lbw for 15 to bowl Notts all out for 203. But it looks like it may have been a poor decision by umpire Rob Bailey, with the ball seeming like it was going down leg, and leaves Chris Read stranded on 81. Will stand-in Yorkshire captain Joe Root enforce the follow-on, or will he decide to give his bowlers a little rest before having another go at the Notts batsmen? BBC Radio Leicester's Richard Rae: Not often you see a batsman in a cap and a keeper in a helmet! @niallnobiobrien bats for @leicsccc against Glos. It's all getting a bit tense for Division Two leaders Worcestershire as they lead by 30 runs with only four second-innings wickets left against fellow promotion hopefuls Surrey. Alex Kervezee is the latest Worcestershire batsman to fall, lbw to Matt Dunn for 38. The last-wicket partnership between Chris Read and Harry Gurney at Trent Bridge is now worth 63. The pair have held their own against the pace of "headband warrior" Jack Brooks and Steven Patterson and the deadly spin of Adil Rashid. Chris Read hits a four to take his side past the 200 mark, giving them what could prove to be a valuable batting point in the race for second with Warwickshire. BBC TMS: Suspended @Yorkshireccc captain @GaleyLad says he will play a full part in celebrations if they win the title: "I want to do a John Terry. When I came in for training there was a Chelsea shirt on my peg. I knew who it was - Tim Bresnan. Expensive gag." Not unless Harry Gurney has anything to do with it - he is still frustrating Yorkshire on 14 not out. Durham's Ben Stokes, today awarded a central contract by the ECB, departs lbw to Middlesex's Toby Roland-Jones for just 15, having shared a 40-run partnership with Paul Collingwood at Lord's. The visitors lead by 240 with four second-innings wickets remaining. It is now up to Durham's captain to put his side in a more commanding position. Notts number 11 Harry Gurney is closing in on his highest first-class score of 24 not out - he is unbeaten on 14. He and Chris Read have put on 50 for the last wicket - the highest partnership of the innings. BBC Coventry & Warwickshire's Clive Eakin at Edgbaston: Northants' 37-year-old spinner James Middlebrook is rewarded for his considerable efforts as he finishes with a five-wicket haul as Warwickshire looked to score runs quickly after lunch. The Bears have declared 300 ahead and look set to move into second place in the Championship. What was in his sandwiches? Northants spinner James Middlebrook has been on fire since lunch and has made Keith Barker his fifth victim, the Warwickshire man out for six. That was the signal for the home side to declare on 573-9, a first-innings lead of 300. Durham captain Paul Collingwood has been given a life by Middlesex after an edge off the bowling of Toby Roland-Jones bounces out of Dawid Malan's hands in the slips. Durham are 129-5, a lead of 230 over Middlesex. Chris Read is playing a captain's innings for Nottinghamshire, reaching his half century with a four off Steven Patterson. Harry Gurney remains at the crease on eight not out - his highest first-class score of the season. While Chris Woakes is struggling at Edgbaston, Chris Jordan - another man to be awarded a central contract by the ECB - has his first scalp of the day at Hove. Lancashire opener Paul Horton is out for 16, caught by Luke Wright towards third man, leaving the strugglers 31-1 and trailing Sussex by 83 runs. "It's been a positive start by Lancashire under the lights at Hove. They are 31-0 with the deficit down to 83. "Lancashire will be hoping the light doesn't deteriorate any further. They need to stay on and set Sussex some kind of target tomorrow." receiving a central contract from the ECB, has become Northants spinner James Middlebrook's fourth victim of the Warwickshire innings, falling for just one run. And Rikki Clarke soon follows suit when he sent back a catch to Neil Wagner, leaving the hosts 547-8.
strangepasserby: Sam Robson's place under threat, yes. But Adam Lyth much closer than others. Alex Hales and Jason Roy have only had one good year. Cassian Graham: Great to see Adil Rashid playing well. Must be a contender for England in the next year. An average of 44 with the bat and 26 with the ball. Derbyshire are really struggling at 18-3 against Glamorgan, and it has been a miserable debut for Cheteshwar Pujara. The India Test batsman made just seven in the first innings at Cardiff and lasted just six balls before falling to Michael Hogan without scoring. That victory target of 261 seems a long way off. OptaJim: 397 - @Yorkshireccc have reached 400 in 10 of their 15 @LV_Cricket first innings this season, at an average of 397. Foundations. Chris Read's four at the end of a Tim Bresnan over leaves number 11 Harry Gurney facing Adil Rashid in the next. Joe Root has six men around the bat but the England limited-overs international knocks the first one for four, before holding out, albeit it nervously, for the rest of the over. Derbyshire, chasing 261 to beat Glamorgan in Cardiff, have made a poor start to their chase, with Billy Godleman the second wicket to fall, lbw to Michael Hogan. India batsman Cheteshwar Pujara is the next man to the crease. Another batsman is wandering back to the pavilion at Edgbaston. James Middlebrook has his third wicket of the innings in the form of Tim Ambrose for 18. Warwickshire are now 535-6, a first-innings lead of 262 runs. Is there any doubt that acting Yorkshire captain Joe Root will enforce the follow-on when Notts are all out? Middlesex scored 472-3 in the fourth innings to win by seven wickets. Worcestershire have just lost Tom Kohler-Cadmore for 20 after he was run out by Steven Davies at New Road. The hosts are now 139-5, five runs ahead of Surrey. "The crowd at Edgbaston give Sam Hain an enthusiastic ovation as he leaves the field, bowled round his legs by James Middlebrook for 208. It was a wicket the hardworking Middlebrook deserved." BBC London 94.9's Kevin Hand: Tim Murtagh makes it nine in the match as he collects Middlesex's bane Scott Borthwick. They do need another wicket-taking burst to keep the target down. Sam Hain's wonderful innings, a career-best 208 from 337 balls, is over at Edgbaston. Warwickshire are 520-5 against Northants, a first-innings lead of 247. BBC Radio Nottingham's Dave Bracegirdle: Delighted that Yorkshire skipper @GaleyLad is now with us on comms. Ball-by-ball commentary from Trent Bridge continues on BBC Radio 5 live sports extra and via the Live Coverage tab. Oh dear. Nottinghamshire really are falling apart here. Veteran Gary Keedy, playing in his second-first class match of the season, clips an Adil Rashid delivery high in the air and the grateful Tim Bresnan is underneath to catch it, ensuring maximum bowling bonus points for Yorkshire. Harry Gurney, a man with a first-class batting average of five, is the last batsman in. And we already have wickets beginning to tumble. Leicestershire's Josh Cobb has fallen after lunch for Craig Miles' second wicket of the innings, as the visitors trail Gloucestershire by 297 runs. Durham's Scott Borthwick went to the first ball after lunch from Tim Murtagh, who now has 4-32 for Middlesex. "It's been a tricky year for him. He was a little bit disappointed this morning after finding out he wouldn't get a central contract. He knew the writing was on the wall. "The winter didn't quite go to plan for him but he's as fit as I have ever seen him. He's given himself every chance to get back into that England side. His pace is a little bit down and he knows that but he's working hard to get that back." The sandwich tray is empty. The orange peelings are lying all over the dressing room floor. We're about to get underway across the country after lunch. on this link and choosing your poison. More from Yorkshire captain Andrew Gale on missing the game at Trent Bridge. "It would be nice to be leading the lads out in these last two games and be part of it. Ultimately I've been captain for five years and if I miss this game or that, so be it. I'm the one who has led them to the Championship if they win it. "We've played a positive brand of cricket with no fear of failure. All we want the lads to think about is score as many runs as possible. We've got a whiteboard in our dressing room - score as many runs as possible, take as many wickets as possible. It's as simple as that. Yorkshire captain Andrew Gale has admitted his frustration at being sidelined as his team march towards their first County Championship title in 13 years. Gale received a two-game ban after being reported by the umpires at last week's Roses match for "using language or gesture that is obscene or of a serious insulting nature." It was Gale's second disciplinary offence in less than 12 months after he was punished for dissent in the previous Roses fixture in May. "It's been very frustrating," Gale told BBC Radio 5 live sports extra. "Coming off the field after a fantastic win against Lancashire to find out I'm going to miss the last few games of the season, it knocked the gloss off the win. I was getting over the emotions, but when you get to the ground here and and the game is out of your control, it's tough." So, do Yorkshire have enough time to lift the coveted trophy by the end of the day? And what do you think of the ECB's decisions over central contracts? One man hoping Yorkshire can finish it off before Friday evening will be Michael Vaughan. The ex-England captain was part of the last Yorkshire side to win the Championship title back in 2001, and is extremely impressed with the current set-up at Headingley. "He's just a typical kind of guy that loves cricket, he speaks to his players as normal people. "All the talk will be Jason Gillespie and [captain] Andrew Gale, but [director of cricket] Martyn Moxon deserves a lot of credit for what he has done at the club. He's never won a title and let's hope Yorkshire do win the title because it's fully deserved for someone that's been a revelation in developing players and a structure to allow players to play." BBC Newcastle's Martin Emmerson: The third morning has been very reminiscent of the first, with Durham losing three wickets and Tim Murtagh causing them problems again. Murtagh now has eight wickets in the game after he claimed Phil Mustard for 25 and Mark Stoneman for 0 this morning. Both were caught behind. But Scott Borthwick has done his best to stem the flow with a determined 30 not out. He added 66 in a fourth-wicket stand with Michael Richardson, which ended when Richardson was bowled for 40 by Neil Dexter just before lunch. Thanks Phil (great name by the way) for guiding us through what has been a wicket-laden morning across the country. Go and have yourself a nice lie down. The main talking point this afternoon will, of course, be whether Yorkshire can turn the screw and finish off Notts within three days at Trent Bridge, or if the hosts can save some face and take it at least into the final day. Speaking of a well-deserved lunch, it is time for mine - ham and cucumber sandwiches, a banana and a coffee. I will leave you in the capable hands of Phil Shepka for today's afternoon session. It will be around 15 minutes until all of our matches resume after a well-deserved lunch. Remember you can follow all of today's action live via the Live Coverage tab, with BBC local radio and BBC Radio 5 live sports extra providing ball-by-ball commentary from all seven ongoing games. Yorkshire CCC chief executive Mark Arthur thinks the disappointment of missing out on the title last season has spurred Yorkshire on this year. "The thought of Yorkshire winning the title at Trent Bridge over the next couple of days gives me a little bit of a tingle," he told BBC Radio 5 live sports extra. "It's a long time since Yorkshire won anything - they last won the County Championship in 2001 - and I will be particularly pleased for chairman Colin Graves, who has kept Yorkshire going, and captain Andrew Gale, who is Yorkshire through and through. "Last year was a huge disappointment when we were beaten by Durham at Scarborough (who went on to win the title). I think everybody learnt a lesson from that and that's why we are not getting carried away. "They are a fantastically talented group of players and Gale keeps them together. I'll be very pleased for them and everyone involved." BBC London 94.9's Kevin Hand: Neil Dexter struck in last over of the morning and Middlesex desperately needed that. The lead had just hit 200. The swing bowlers will be key, especially Tim Murtagh, after lunch. BBC Coventry & Warwickshire's Clive Eakin: Warwickshire's steady accumulation in the morning session suggests they intend to bat long and big on the third day. Teenager Sam Hain remains unbeaten on 207 and they lead Northants by 245 at lunch. BBC Sport's Lizzy Ammon: The huge 360-run partnership between Jonathan Trott and Sam Hain was finally broken when Trott was caught in the deep for a fantastic 164. Hain, however, has advanced past a double century and has looked fantastic this morning - driving fluently, cutting well and leaving with the patience of someone beyond his years. BBC Radio Manchester's Scott Read: A good morning session for the home side, having resumed with a lead of 21. It took over an hour for a breakthrough as Lancashire were frustrated by Chris Jordan and Ashar Zaidi. Under increasingly gloomy skies, Lancashire will come out and bat under floodlights still very much needing to win this game. Please remember to put your name on texts and emails. No name: With the form Lyth is in, and his doubtless familiarity with the other Yorkshire internationals, surely he should be given the chance to partner Cook? So much staying power. England's central contracts. Tim Bresnan, Matt Prior and Jonathan Trott have been dropped from the list, along with Graeme Swann (retired) and Kevin Pietersen (not required). Sussex's Luke Wright, Hampshire opener Michael Carberry and Nottinghamshire batsman Michael Lumb have lost their increment contracts. Durham's Michael Richardson has been bowled by Neil Dexter for 40 with the final ball before lunch at Lord's, leaving the visitors 99-4, exactly 200 ahead after Tim Murtagh's two early breakthroughs for Middlesex. Yorkshire have had a superb morning, taking four more Nottinghamshire wickets and reducing the hosts to 139-8 at Trent Bridge. Jack Brooks and Ryan Sidebottom both struck early on, before Adil Rashid picked up two in an over to further turn the screw. The visitors need just 12 more wickets to secure a first Championship title for 13 years. The new ECB central contracts have led to further Twitter debate about who should partner Alastair Cook at the top of the order in England's Test side. Adam Williams: No ECB contract for Sam Robson suggests it opens to door to the likes of Hales, Lyth and Roy to push for a Test place. Macca Gaunt: Reckon Hales could replace Robson if Hales has a good winter. Lewis Hatchett is the final Sussex batsman to fall. Another victim for Lancashire spinner Simon Kerrigan, who finishes with 3-117. The Red Rose county are desperate for victory to aid their survival chances in Division One, but first they must erase a first-innings deficit of 114. The players will now take lunch at Hove. Tom, York: Yorkshire are a brilliant side, so strong even without the England players. I'm a bit young to have seen them but I'd suggest they've some way to go to best the great Yorkshire teams of the 60's and 30's. At Lord's, Durham batsman Mark Richardson has picked up his second five of the morning against Middlesex, after Toby Roland-Jones' wayward throw went for four overthrows. Durham have moved on to 90-3, a lead of 191. Scott Borthwick and Richardson's partnership has moved on to 57, with the visitors looking to put themselves in a commanding position with 15 minutes to lunch. Moeen Ali is out, shortly after reaching his second half century of the match for Worcestershire against Surrey at New Road. Meanwhile, Derbyshire have lost opener Ben Slater for just two and are 6-1, chasing 261 to beat Glamorgan in Cardiff. What a year Warwickshire's Sam Hain is having. The 19-year-old has just made his maiden double century in first-class cricket against Northants. But Jonathan Trott is out for 164, ending their fifth-wicket stand at 360. "Having already broken Ian Bell's record for being the youngest Warwickshire batsman to score a century earlier in the season, Hain has now become the youngest to make a double ton, again beating a record previously held by Bell." Away from the domestic game, the ECB have announced the 12 players who have been awarded central contracts for 2014-15. The full list of centrally contracted players is: Moeen Ali (Worcestershire), James Anderson (Lancashire), Gary Ballance (Yorkshire), Ian Bell (Warwickshire), Stuart Broad (Nottinghamshire), Jos Buttler (Lancashire), Alastair Cook (Essex), Steven Finn (Middlesex), Chris Jordan (Sussex), Joe Root (Yorkshire), Ben Stokes (Durham), Chris Woakes (Warwickshire). A further five players have been awarded increment contracts: Ravi Bopara (Essex), Alex Hales (Nottinghamshire), Eoin Morgan (Middlesex), Liam Plunkett (Yorkshire), James Tredwell (Kent). There is no contract for Middlesex opener Sam Robson, who may now have to sweat on his Test place ahead of the tour to the West Indies next April and May. Two wickets in the over for Adil Rashid as Yorkshire continue their charge towards their first Division One title since 2001. Jake Ball is lbw for just two, offering no stroke, and Notts are 126-8. At this rate, they could be popping the champagne corks in Leeds, Barnsley, Sheffield and York tonight. Or maybe just a celebratory cuppa. Either way, it will taste particularly sweet. Lancashire spinner Simon Kerrigan has dismissed Sussex batsman Ashar Zaidi for 66 at Hove. A valuable innings for the hosts, who are 422-9 and lead by 102 runs. I said Adil Rashid would have an impact, and he has. Luke Fletcher rashly hits against the spin and picks out Jack Brooks at deep cover. Another avoidable wicket for Notts, who trail by 409 runs. Steven Patterson is about to get his first bowl of the day. The Yorkshire seamer only bowled two overs yesterday evening, which went for 12 runs. His first two balls are defended easily by Chris Read. "There will come a point where Joe Root has to look at the physical condition of his bowlers and look at the follow-on. "It would be tough to keep on going from now and get 14 wickets without a rest." Yorkshire leg-spinner Adil Rashid has not taken a wicket yet in this innings but he is getting huge amounts of turn from the Trent Bridge surface. He is certain to come more into the game as the match progresses. Maybe Joe Root will use him at one end and rotate his quick bowlers from the other? Fellow spinner Gary Keedy finished with five wickets for Nottinghamshire in Yorkshire's first innings. Absolutely imperative that Notts make it through to lunch without further damage. Chris Read and Luke Fletcher seem to have steadied things a little after the losses of Michael Lumb and Riki Wessels in the first hour. Tim Bresnan, sporting a beard at Trent Bridge, asks for an lbw against Fletcher but the umpire is unmoved. "Ashar Zaidi has gone to his first 50 of the season with a six off Simon Kerrigan. "The floodlights are on - it's very gloomy here, and just for good measure neither scoreboard is working!" "Chris Jordan has been run out trying to take a second run - Tom Smith's excellent throw to Jos Buttler brings Lancashire a much-needed breakthrough." Three wickets to tell you about - Worcestershire's Tom Fell has gone for nine, bowled by Surrey's Gareth Batty, leaving the hosts 63-3 in their second innings. At Bristol, Leicestershire's third-wicket partnership of 103 is over as Dan Redfern is out for 60 against Gloucestershire. And Chris Jordan's resistance is over at Hove. The Sussex all-rounder is run out for 41 but an eighth-wicket stand of 104 runs with Ashar Zaidi has put his side in command against Lancashire. Michael Hogan is the last Glamorgan batsman to fall, caught at mid-on off the bowling of Tony Palladino, leaving Derbyshire a target of 261 to win their Division Two fixture in Cardiff. Glamorgan have not won a Championship game since June, so could this be their day? "The eighth-wicket partnership between Chris Jordan and Ashar Zaidi is now worth 83. It's taken Sussex's lead to a very useful 70 runs." Despite his side being in a handsome position at Trent Bridge, Yorkshire head coach Jason Gillespie is not getting too carried away. BBC Radio 5 live's Tuffers and Vaughan Cricket Show last night, the former Australia paceman said: "It's just about focusing on what we can do and what we can control. We can't worry about other games, we can't control weather, all we can do is all we can do. It sounds very simple, but it is as basic as that. We go out there and play a positive brand of cricket." And on the possibility of losing more members of his team to England: "You have to look at what county cricket is for. Our county is very ambitious, we want to win trophies as often as we can, but we also have an obligation to help players achieve their dreams of playing for their country." Derbyshire's Mark Footitt is at it again - he now has 3-42 and Glamorgan are 176-9 in their second innings following the dismissal of Kieran Bull. The Welsh side are 255 ahead. "Two early wickets for Surrey and Jade Dernbach with both of them. He bowled Daryl Mitchell for three and then had Richard Oliver caught behind for 24. "Moeen Ali looks in delicious form but there is still lots of work for the batsmen to do." At New Road, Worcestershire's Richard Oliver is out for 24, Surrey's Jade Dernbach again the successful bowler. England all-rounder Moeen Ali is 21 not out as the hosts are 58-2 in their second innings, giving them a lead of 76. Notts make it past 100, unfortunately for the loss of six wickets. Those four wickets yesterday evening, having been flogged around the park by Yorkshire's batsmen for most of the previous two days, put them firmly on the back foot. Luke Fletcher escapes a huge lbw shout from Adil Rashid. Replays show Fletcher may have got away with one, but after Michael Lumb's disputed dismissal earlier, maybe that has equalled things up. Just like Warwickshire team-mate Sam Hain, Jonathan Trott has now passed 150 in the Bears' Division One game with Northants at Edgbaston. Warwickshire, who had a remote chance of the title at the start of the week, are 469-3 in their first innings, while the partnership stands at 327. Leg-spinner Adil Rashid is on to bowl for Yorkshire - his first ball is played out towards point for two runs by Chris Read, who is 15 not out. Tim Bresnan is also brought into the attack by Joe Root as the visitors look to continue their excellent start to day three. "With a potential Championship win on the horizon, some of the older Yorkshire supporters will be thinking of (director of cricket) Martyn Moxon. "He has been through some highs and lows with the county as both a player and as a coach. If that trophy is lifted, there will be a few people raising a glass to Martyn too." Notts have lost two wickets in the first 50 minutes of play on day three and trail by 439 runs. Once Jack Brooks and Ryan Sidebottom fancy a break from bowling, there's the small matter of Tim Bresnan and Adil Rashid to cope with, so it could be a long day for the hosts. Meanwhile, Yorkshire captain Andrew Gale will be live on BBC Radio 5 live sports extra during the lunch interval at Trent Bridge, starting at 12:30 BST. You can listen to live BBC local radio commentary of every Championship game on your desktop via the Live Coverage tab. Derbyshire are close to wrapping up the Glamorgan tail in Cardiff - Mark Wallace the latest batsman to fall. The Division Two match is delicately poised, with the Welsh side 172-8 in their second innings, a lead of 251. "It has been a frustrating first half hour for Lancashire. Chris Jordan and Ashar Zaidi, both looking largely untroubled, have added 69 for the eighth wicket and Sussex now lead by 52. "Simon Kerrigan might have had Jordan caught at mid-on but Glen Chapple seemed not to pick up the ball and the chance went begging." So then, Yorkshire fans, how about that for a start? Surely the Championship title is not too far away. Where does this current team rank in the history of the county, or even the Championship as a whole - among the best ever? Another one down at Trent Bridge, another poor shot from a Notts batsman, another step closer to the title for Yorkshire. Riki Wessels perishes to the evergreen left-arm seamer Ryan Sidebottom, caught behind by Jonny Bairstow for 21. Notts in tatters at 82-6 and the follow-on looms large. BBC London 94.9's Kevin Hand: And there's an eighth for Murtagh - fightback is on for Middlesex, who could do with a win as their last match of the year is at Lancashire. "Runs are flowing easily for Warwickshire this morning without any chances for Northants. The hugely talented Sam Hain moved quickly past 150 and has hit a couple of beautiful looking flowing drives. He's added 25 to his overnight score in the first half an hour with Jonathan Trott, also scoring fluently at the other end. "Warwickshire will know that Yorkshire have all but grabbed the title at Trent Bridge but will have second place firmly in their sights as they look to secure a big first-innings lead and bowl out Northants without having to bat again." Warwickshire's Twitter feed now tells us this is the highest partnership for any wicket for Warwickshire against Northants. Another wicket falls at Lord's, where Durham's Mark Stoneman has become Tim Murtagh's second victim of the morning session. The visitors are 33-3 in their second innings. Notts captain Chris Read has just survived a hostile few balls from Jack Brooks, whose tail must be up after dismissing Michael Lumb. Replays suggest the Yorkshire bowler may have been a tad fortunate to get that lbw decision, but they all count. At the other end, Riki Wessels has thrashed Ryan Sidebottom through the covers for four. Second wicket of the morning for Derbyshire in Division Two, as veteran Glamorgan spinner Dean Cosker falls lbw to Tony Palladino.